Selected hardwood is finished with multiple coats of lacquer for added durability. Metal edge is ideal for straight-line cutting and for drawing clean lines. Scaled in 1/16 on one edge and millimeters on the other. Three-hole punched for easy-access storage in a binder; hanging hole at one end. 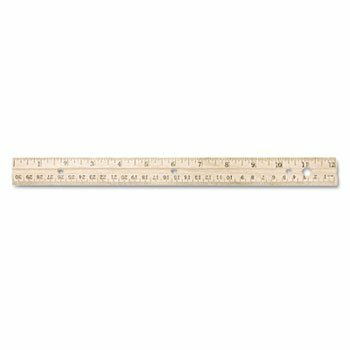 Ruler Type: Standard/Metric; Length: 12 in; Standard Scale: 1/16 in; Metric Scale: Millimeters.